Moto63 create stylish, crowd pulling, quality custom motorcycles where style, function and performance are of equal importance. Founded by two motorcycle obsessed brothers, Mick and Andrew, who value the fun aspect of motorcycling and wanted to bring some style as well as smiles back to motorcycling. Disillusioned with the run of the mill, plastic clad, mass produced twenty first century offerings available, Moto63 decided that they had the skills, knowledge and ability to bring individuality back to biking and offer custom motorcycles and motorcycle parts to all. 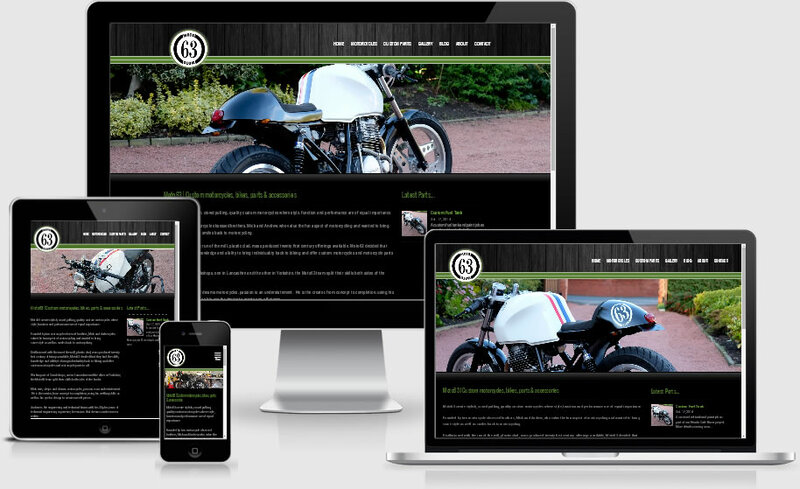 The website needed to reflect on the current cafe racer and “shed built” bike trend that is getting bigger and bigger each week but also focus on allowing Mick and Andrew to add custom bikes, parts and more to the site. So we went for the twin racing lines, black shed wood textures and other cafe racer style touches for higher resolution users.